Attendees and organizers participate in a live auction at the McGaw YMCA on Saturday. 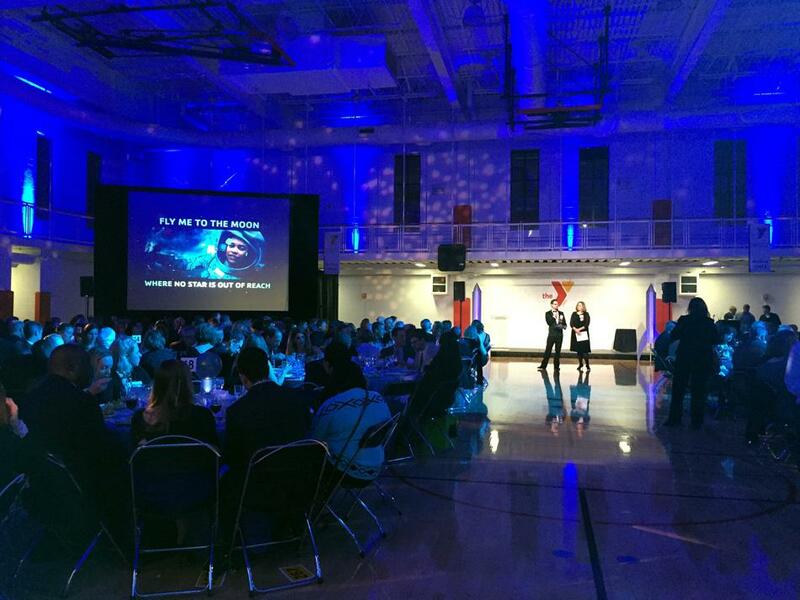 The McGaw YMCA held a gala that recognized a foundation and NU professor for their contribution to Evanston youth. The McGaw YMCA hosted a gala Saturday to honor a local foundation and a Northwestern faculty member with an award that recognizes their contributions to Evanston youth. The gala, themed “Fly Me to the Moon, Where No Star Is Out of Reach” this year, is held annually to raise money and recognition for the McGaw YMCA’s youth programs, said Cherita Ellens, senior director of marketing. The honorees this year were the Lewis-Sebring Family Foundation and NU faculty member Lucile Krasnow, who both received the McGaw YMCA Leadership Award. The foundation was recognized for the past 129 years the work of those who have substantially contributed to the Evanston community with the award, according to Mark Dennis, Jr., McGaw YMCA president and CEO. “We are looking for people who have been consistent, who have been persistent, who have been a … civil community broker in the community towards learning and advancing the work and potential of youth,” Dennis said. Dennis said the award was meant to honor groups who have substantially contributed to the Evanston community. Krasnow was recognized for her 15 years as NU’s special assistant for community relations. The award aimed to equally recognize the efforts of the University in promoting education in Evanston through programs including the Children’s Center and Project SOAR, which arranges for NU students to tutor local school children. Krasnow is retiring Spring Quarter. “I feel privileged and honored because I have tremendous respect and admiration for the work the McGaw YMCA has done for the community,” Krasnow said. The Lewis-Sebring Family Foundation was recognized for its philanthropic sponsorship of many of the McGaw YMCA’s programs, including the creation of the MetaMedia Youth Center, which aims to teach students technological skills, and the construction of the Sebring Lewis Center, which was the venue of the gala. The foundation gave $1 million toward the MetaMedia Youth Center in September. The gala began as a small event run entirely by McGaw YMCA’s youth services to raise money for its many youth goals, including teaching children to swim and providing activities to all students, regardless of family income, said Sue Sowle, McGaw YMCA’s senior director of youth services. More than 400 guests, including donors, YMCA members and public officials who have supported the McGaw YMCA’s efforts, attended the gala on Saturday. Among the guests were Mayor Elizabeth Tisdahl, District 202 Superintendent Eric Witherspoon, Evanston/Skokie School District 65 Superintendent Paul Goren, D202 board member Bill Geiger and several members of the Illinois legislature. The evening included several fundraising activities such as auctions and raffles for vacations. NU was the largest gala sponsor.